SF Organics meets the standards for the Organic Materials Review Institute for operations that are certified under the USDA National Organic Program. Schafer Fisheries is committed to supplying an environmentally-friendly alternative to common-day toxic fertilizers, thus preserving the environment for future generations. We are here to help with all of your fertilizer needs. Offering a natural organic fertilizer to support your crops and organic farming solutions. 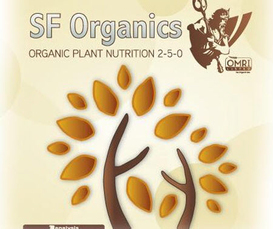 ​High Phosphorous organic liquid plant food (ORMI Certified), supporting a health microbial/biological soil environment for superior plant health. 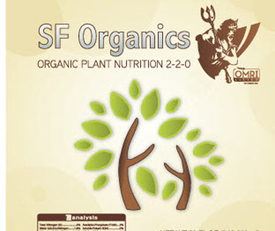 Organic plant nutrition derived from sea kelp. This product is not OMRI listed. 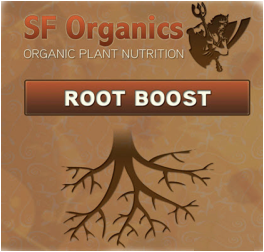 ​Root Boost contains nutrients, minerals, proteins & calcium with the added benefit of endo/ecto mycorrhizal fungi; supporting a microbial environment for enhanced nutrient absorption.